NASA's telescopes have confirmed an Earth-like planet orbiting a (relatively) nearby star. Since its launch in 2009, the Kepler space telescope has been watching more than 150,000 stars. The telescope is set to detect any small disruptions to any star's light made by planets orbiting around them, and today NASA announced they have confirmed a new planet - dubbed Kepler 22-b - which resides in the so-called habitable zone of its star about 600 light years away from Earth. 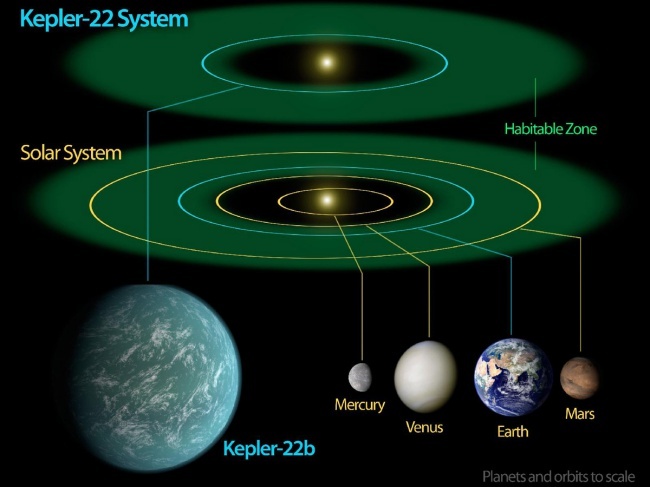 Kepler 22-b is about 2.4 the size of Earth and its average temperature is 22 degrees Celsius (71.6 F), making it theoretically possible to support life. Kepler 22-b is just one of 2,326 "candidate" planets discovered by the telescope of which 54 are believed to orbit in a habitable zone around a star. The habitable zone is shorthand for the proximity of the planet to the star (see image below) so that the surface temperature is neither too hot or too cold to support life. When the dip in the star's light is observed by the Kepler telescope, the team then confirms its existence with other telescopes, a process that can take years of observations. "Fortune smiled upon us with the detection of this planet," said William Borucki from NASA's Ames Research Center. "The first transit was captured just three days after we declared the spacecraft operationally ready. We witnessed the defining third transit over the 2010 holiday season." Kepler 22-b is 15 percent closer to its sun than Earth is to ours, so its year is approximately 290 days. Its sun shines about 25 percent weaker, however, meaning the 70 degree F temperature would support water in a liquid form. 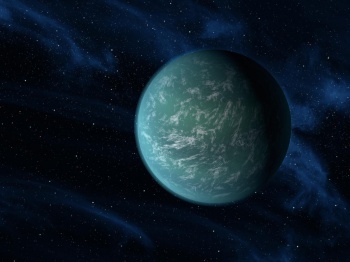 Scientists have not yet determined if Kepler 22-b has water, or even if it is consists of rock or gas. Wouldn't it be great if we had a space shuttle program working to go check this kind of stuff out? Of course, we would also need Warp Drive to travel the 600 light years to Kepler 22-b. Well, we should get on that too. Isn't it almost time for Zefram Cochrane's historic flight? *checks wikipedia* Crap, we have to wait until 2063.